WaPo review: Soaring, swooning and gently nostalgic, “Brooklyn” takes melodrama to a new level of reassuring simplicity and emotional transparency. The exquisite adaptation of Colm Tóibín’s novel about a young Irish woman immigrating to the United States in the early 1950s dispenses with trendy flourishes and sniffy commentary to deliver the kind of movie that Hollywood rarely makes anymore: a sincere, unabashedly tender coming-of-age tale that, for all its deep feeling and wrenching twists and turns, never gives in to sentimentality or maudlin theatrics. Variety review: In a sense, a project like this calls back to what it imagines as a cornier, less cynical era, which is does simply by ignoring the rampant cynicism of the time — it’s set during the tail end of America’s second Red Scare, smack-dab in the middle of the Korean War, and bears no trace of either. Buoyed along by a beautiful Michael Brook score, “Brooklyn” is just the sort of escapist entertainment its own characters might have chosen had they paid their 65 cents for a night at the cinema way back in 1952, the year the film opens, when the infectiously nostalgic “Singin’ in the Rain” (which Ronan’s protagonist goes to see at one point) and the garishly square “The Greatest Show on Earth” vied for Oscars. Toibin’s story centers on a heart torn between two equally respectable options; naturally, the balance is tipped in America’s favor, thanks to a star-making performance from relative newcomer Emory Cohen (of “The Place Beyond the Pines”), though the movie offers a formidable alternative in Domhnall Gleeson, representing all Ireland has to offer. NYTimes Review: “Brooklyn” endows its characters with desires and aspirations, but not with foresight, and it examines the past with open-minded curiosity rather than with sentimentality or easy judgment. Its New York and Irish landscapes are both romantic and constricting. There are streetcars, rooming houses and department stores on one side of the ocean, tidy shops and dark-paneled pubs on the other. There are also a lot of rules and expectations for young people, women in particular. Eilis does not experience these norms as unduly oppressive. They are what she’s used to and also, as such, the condition of her freedom. rogerebert.com: The persistent feeling that this movie so beautifully creates is that even when the world is bestowing blessings upon us, it’s still at the bottom a sad place, and the key to an emotionally healthy existence involves some rooted acceptance of that. The movie ends with Eilis having made some substantial steps to that accepting place, and also determined to move purposefully forward. 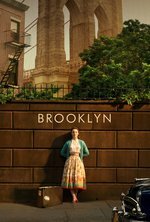 People have spoken about how understated and old-fashioned “Brooklyn” is, to the extent that it might come across as a pleasant innocuous entertainment. Don’t be fooled. “Brooklyn” is not toothless. But it is big-hearted, romantic and beautiful. I really thought I would LOVE this movie. I found it to be a half step above what you might find any day of the week on Lifetime. It is completely predictable, absurdly clean -- as in, every location looks like it's just been buffed by an army of janitors, and that Italian family? Really? Nope. I can't understand what all the fuss is about. I'd give it 2 stars. maybe. That being said -- Julie Walters is a hoot and I wish the movie had been about her character! Nonetheless, as beautifully as this movie was filmed, it didn't quite come together for me. Ronan is a fine actress, with the beauty of a star from the '30s or '40s, but when it came to romance she was opaque. I did not know what she felt until the climactic scene. I loved it, and I think the reason she is opaque is that the character in the book is very opaque. I adored the book and though it'd be terribly difficult to bring to the big screen because of how fully interior a character Eilis is, but Ronan did a gorgeous job with it. And I was 100% delighted with the casting of Tony and his goofy grin and his shortness. I was all ready to be mad if they made Tony too Hollywood. Okay I came back to say more about Eilis's interiority, this kind-of combines book and movie. She's a very passive character at the beginning, and she's a people pleaser. She goes to America because her sister wants her to; she returns because her mother wants her to; she dates Tony because Tony wants her to. She's a "good girl" at the boarding house and a good employee at the department store and a favorite with the priest because she follows the rules and avoids conflict and does as she's told. So she's not a kind of character we see as a protagonist very often, who's so passive and introverted. And she's quiet -- but observant, and smart. And as the story progresses, we see her taking in all these things happening around her, pondering them, learning from them. She learns more by quietly observing than the other girls do by doing things. In the beginning of the story, she's simply passive. But as the story progresses, her quiet observantness becomes strength and understanding. Her essential quietness and introversion doesn't change, but she becomes slowly more sure of herself and her understanding of the world. Anyway, I don't think you know if she's going to pick Tony until the very end because EILIS doesn't know that until the very end. (Tony is definitely way more into her than she is into him!) And even then the first half of her choice is driven by the nosy shopkeeper neighbor -- but Eilis decides to stand up and actually engage in some conflict because she's decided what she wants, and is willing to choose and take something for herself, not just because it's what everyone expects of her. It still doesn't change her reticence, though, and so you're still a little nervous when she and Tony go to look at the land on Long Island, because the story of Eilis growing up is that first she has to come to know her own mind, and then she has to be willing to speak up for it. As for the shininess of NYC in the movie, I didn't pick up too much on that because I'm a sucker for historical costume dramas and I like them pretty, but some of that may be because it's not an American book(/movie) about America; it's an Irish book about America, and specifically about immigrants chasing the "streets are paved with gold" sort of thing. I think the America we see in the book and the movie is real, but also slightly dreamlike, seen through Eilis's Irish family's eyes as a land of opportunity from which Eilis is quite detached at first; but then later it becomes the land of Eilis's dreams too. And the Brooklyn Eilis lives in is really a very gentle place, with only hints of the hardships there; Toibin wants to tell a gentle story, and so he sets it in a rather gentle New York. That's a very apt description of Eilis. When I saw this movie I was a bit letdown that Eilis didn't come down harder on that nosy shopkeeper lady, but the more I thought about it the more I realized that it's just not who she is or even who she should be. That would have just been what I personally wanted to see happen, not what Eilis herself would actually do. That's interesting, Eyebrows. I kind of assumed from the beginning that she would end up with Tony because you can't rightly call the movie Brooklyn and end up leaving it for home. I thought the movie was pretty good, but slow, and unfairly ruined by trailers that needed to set up a love triangle and basically lays out the whole damn movie for you. It was 80 minutes of setting up Brooklyn as a place where she has a life, but that was overshadowed by the knowledge that she has to spend enough time in Ireland to fall in love with some other guy and when will she just get back to Ireland already so that she can make her mind up and return to Brooklyn. graventy, you have a good point about the trailer. I agree that the trailer set it up as a love triangle with Eilis having to make a choice between her two homes, but I thought the actual movie wasn't what the trailer promised. She *married* Tony before going back to Ireland. Of course she's going to go back to Brooklyn, because a) she's married to an American and b) the movie is called Brooklyn. It felt like a bait-and-switch to me, plot-wise, but I otherwise found it to be lovely. Eyebrows McGee's description of Eilis finding her agency is exactly right. Someone on Pop Culture Happy Hour (I think it might have been Stephen Thompson) pointed out that Brooklyn and Carol are both set in New York in 1952. I just saw Carol a few days ago and there are so many parallels. As a twice emigrant/immigrant I really like the return to Ireland portion of the movie. The understated representation of the ease of slipping back into your old culture is something I have experienced many times (and I've only done the fairly easy Canada-England-United States moves) and I felt it was artfully done. I also like how ultimately she rejects her home culture when she realizes that maybe comfortable and familiar isn't better (though I am not sure I feel that way about Canada as my moves have been largely restricted job opportunity driven). This movie spoke to me. Softly. Author Coim Toibin on Saiorse Ronan's portrayal of Eilis. Pretty late to the game but I just watched this movie and liked it a lot more than I expected to. I was a bit thrown off by Ellis as well (and oh boy, that's not how I expected that name to be spelled) because she is so reserved and that's not something we're used to seeing in movies, but I ended up really liking how she was portrayed - she really drew me in. And it allowed the contrast when she started coming out of her shell in Brooklyn to be really obvious. Saoirse Ronin is such a good actor. As for the melodrama, that was fine with me. It felt like watching a movie version of a Maeve Binchy book, maybe a bit classier. I loved the sets. Actually, many of the homes reminded me of the homes of kids I grew up with in a very, very Irish area of Massachusetts. A lot of their families were relatively recent immigrants (their parents or grandparents) so that rang very true.